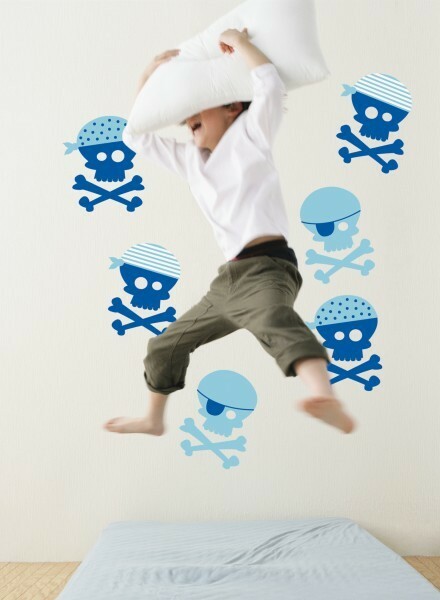 A favourite for any boy, these great Blue Pirate skull and croosbone wall stickers will liven up his bedroom. 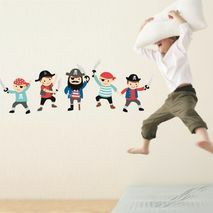 Our decorative wall stickers are innovative, bright and fun. They create a unique look and change the style and atmosphere in a room. We have a considerable range of designs available that allow you to choose the look that will suit you best and the only limitation is your imagination. Our stickers are made from high quality adhesive vinyl and can be removed without damaging your walls or windows. Wall stickers can be adhered to paint*, wallpaper**, or any shiny non-textured surface like windows, bench tops, cupboards, mirrors, wardrobes or tables*. So when you want to change the style of a room, these stickers can be easily removed and replaced with more innovative designs. * For newly painted surfaces allow 3 weeks before application. 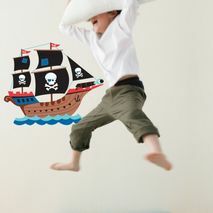 **Our stickers will not adhere to cloth, stucco, brick or similar uneven surfaces - including some wallpapers.